On the extra day in camp we spend the day on a river located on the BC mainland.After crossing Knight Inlet we travel through Thompson Sound to the Kakweikan River and spend the day with Trapper Rick. We travel via old overgrown logging roads to Rick’s cabin which is about two kilometres (miles) from the mouth of the river. 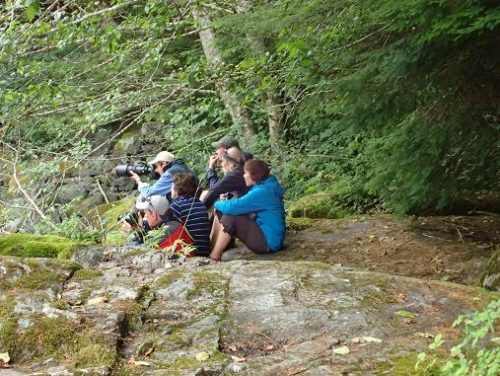 In this photo Rick and four guests are sitting near the falls which is a natural fishing area for grizzlies. Not hard to find Rick in this photo and tomorrow’s post will show what has their interest…. Actually the remains of a black bear killed by a grizzly bear near Trapper Rick’s. 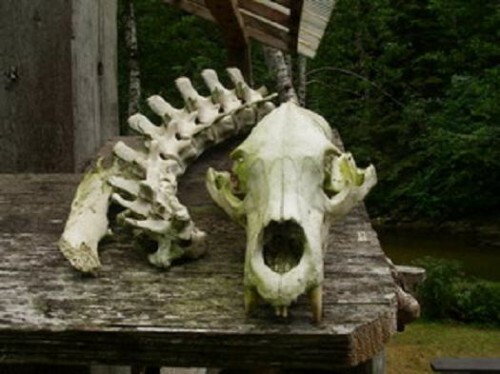 The extra day booked at the lodge involves a trip to Rick’s and a day on the river looking for grizzlies, possibly river fishing and many stories from Rick including how he came by this black bear skeleton.